A celebration of beavers in spring-time will take place in Scotland this weekend (19 – 20 March), as part of the first multinational beaver festival ever to be held across Europe. The Scottish Beaver Trial, the project undertaking the first trial reintroduction of beavers to Scotland, plans to run free events at Glasgow’s Kelvingrove Museum and in Knapdale Forest, the trial area in mid-Argyll which is currently the home of 12 beavers, including two breeding families which are bringing up young kits born last spring. 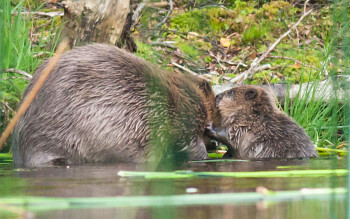 Rallied by Frenchman, Samuel Dubie, a beaver conservationist, organisers in other European countries, including France, Belgium, the Netherlands, Luxembourg and Germany, are also set to host beaver-related events at the end of this month. Simon Jones, Project Manager for the Scottish Beaver Trial, said: “Taking part in the ‘Le Printemps des Castors’ festival, or Beaver Spring as we’ve called it, is important to our project. The festival marks the coming-together of beaver conservationists around Europe to celebrate a keystone species in spring-time, a time when people are naturally keen to get outdoors and enjoy wildlife. “We’re pleased to be bringing the beaver to Glasgow by putting on two events at Kelvingrove Museum. From 11.30 am to 3.30 pm on Saturday 19 and Sunday 20 March, beaver experts from the Scottish Beaver Trial and the Scottish Wildlife Trust will be in the museum’s West Hall running activities including ‘mini beaver dam building’ and a ‘track the beaver’ quiz. “Meanwhile in Knapdale, Argyll, staff from the Scottish Beaver Trial and the Royal Zoological Society of Scotland will be running free tours around the lochs which make up the beavers’ territories there. Spaces for the Knapdale tours are limited to 20 people so booking is essential. The tours will last for 90 minutes and will begin from Barnlusgan Information Centre, where free parking is available. “If you can’t make the weekend activities, you don’t necessarily need to miss out. The Scottish Beaver Trial team will be running one event every month in Argyll to give visitors a chance to tour the beaver trial site in the company of a beaver expert.” For more information, visit the Beaver Trial website. To book your place on a Knapdale beaver site tour contact Polly Phillpot at pphillpot@rzss.org.uk or phone 0131 314 0335. Tours take place on Saturday 19 March from 2 pm to 3.30 pm and 7 pm to 8.30 pm, and on Sunday 20 March from 7 am to 8.30 am. If you are unable to make the organised tours you can do a self-guided walk at the Beaver Trial site by downloading the free walk here on the Walkhighlands website.